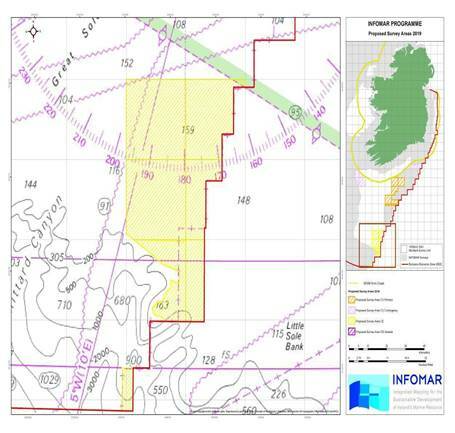 The Department of Transport, Tourism and Sport has been advised that hydrographic and geophysical surveys will be undertaken in the Celtic sea and Atlantic Ocean under the INFOMAR (Integrated Mapping for the Sustainable Development of Ireland’s Marine Resources) programme, between April and October 2019. The vessels involved are as follows, Marine Institute vessels: the ‘RV Celtic Voyager’ (Callsign: EIQN) and the ‘RV Celtic Explorer’ (Callsign: EIGB) and Geological Survey Ireland Vessels: the ‘RV Keary’ (Callsign: EI-GO-9), the ‘RV Geo’ (Callsign: EI-DK-6), the ‘RV Mallet’ (Callsign: EI-SN-9), and the ‘RV Lir’ (Callsign: EI-HI-2). The ‘RV Celtic Voyager’ and the ‘RV Celtic Explorer’ will be towing a magnetometer sensor with a single cable of up to 200 metres in length. The vessels will display appropriate lights and markers. 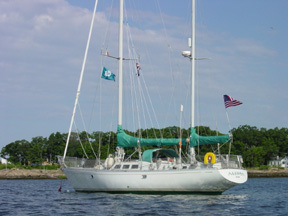 The vessels will be listening on VHF Channel 16 throughout the course of the surveys. Generic coordinates where survey operations are expected to take place are provided below. Detailed coordinates of each survey polygon can be provided on request. (i) The R.V.’s Keary, Geo, Mallet and Lir are expected to carry out survey operations in the northwest Celtic Sea and inshore County Cork, stretching from the Old Head of Kinsale to Cape Clear. 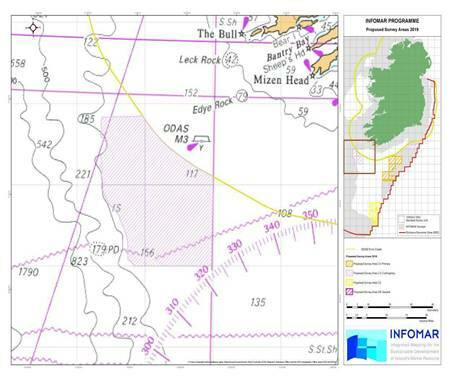 Figure 2: R.V.’s Keary, Geo, Mallet and Lir Celtic Sea survey areas. Figure 3: R.V. Celtic Voyager Celtic Sea primary survey area. Figure 4: R.V. Celtic Voyager Celtic Sea contingency A survey area. Figure 5: R.V. Celtic Explorer Celtic Sea survey areas. 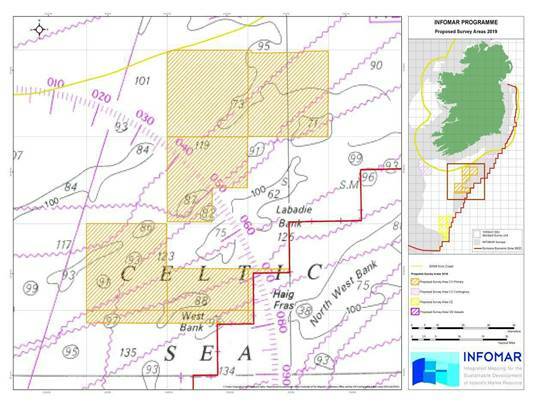 Figure 6: Celtic Voyager Atlantic Ocean contingency B survey area. INFOMAR Charts and information on a bay basis can be found on the website at: http://www.infomar.ie. Images, Bathymetry, Backscatter, Shaded Relief, Classification .pdfs are available. Enquiries or supporting information in relation to the above programme should be directed by email to info@infomar.ie , or by phone to Marine Institute +353 91 387200 or Geological Survey Ireland +353 1 6782000. The International Regulations for Prevention of Collisions at Sea (COLREGS) are implemented in Irish law by the Merchant Shipping (Collision Regulations) (Ships and Water Craft on the Water) Order 2012 [S.I. No. 507 of 2012], and the Signals of Distress (Ships) Rules 2012 [S.I. No.170 of 2012]. See Marine Notice No. 06 of 2013. These Statutory Instruments may be purchased by mail order from Government Publications, Office of Public Works, 52 St. Stephen’s Green, Dublin 2. Tel: (01) 6476834/1890213434. They are also available online at: www.irishstatutebook.ie. Department of Transport, Tourism and Sport, Leeson Lane, Dublin, D02 TR60, Ireland. The Marine Survey Office, Leeson Lane, Dublin, D02 TR60. tel: +353-(0)1-678 3400. For general enquiries, please contact the Maritime Safety Policy Division, tel: +353-(0)1-678 3418.